I finally got in to see the Dr. today about my foot. They took x-rays and all that fun stuff. Then I met with the Dr. who showed me the x-ray. He enlarged it to show me that there is the tiniest bone spur starting on my heel. It's not big enough to be a major issue at this time but may be part of the issue. He poked at my foot a little bit and asked me what hurt. Then he explained that plantar fasciitis and possibly a stress fracture is the main issue. Of course, because when it comes to running related issues 'go big or go home', right? Ugh... Could have been worse though so I'm very thankful that it isn't more serious. 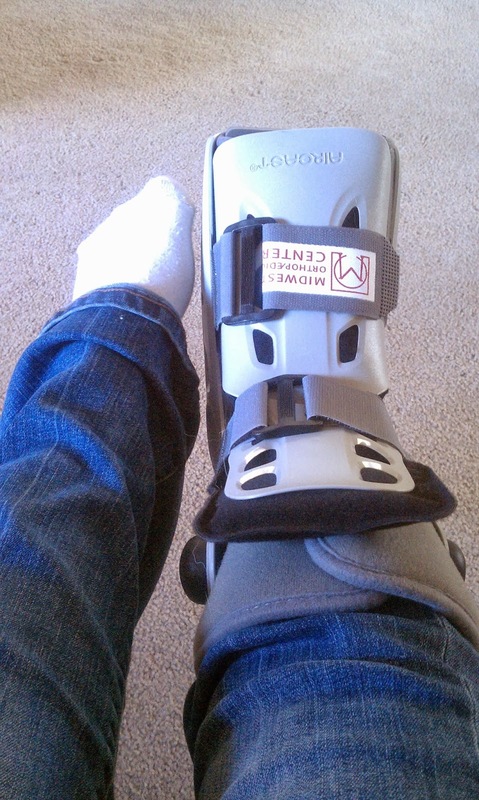 There is further testing that can be done to be certain of a stress fracture but either way the treatment is the same. If I wanted to know just for the sake of knowing for sure then they would do that testing but to me it seems a bit silly not to mention more time and money just to end up doing the same treatment anyway. So, now I get to wear this fabulous boot. Grey is sooo the new black! After 3 weeks I will see if there is any improvement and if so then I can try a light jog. If not then I have to keep wearing the boot. I also was given a list of a few exercises that I have to do everyday along with continuing to roll my foot on a frozen water bottle. Danyelle has already gotten a good laugh at my expense. She knows my schedule of drop off kid 1, pick up kid 2, then pick up kid 1, etc... which all means that I will be driving without the boot and then have to put it on before I walk in to pick up my kids, then take it back off when I get back in the car. Rinse and repeat all day long because I basically do little else than run my children to school and other activities. The velcro on this boot is going to get quite the workout. 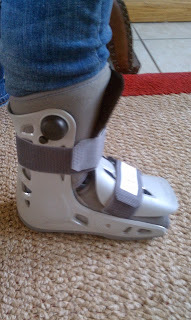 Plus, I get to feel just a little stupid having to wear the boot for the 10-15 minutes it takes to get my daughter or son into school and set up. Then just take it back off again when I get back out to the car.